A problematic family story holds that the child Edward (b. 1839) was carried off the boat in the port of New York by his father. For the dates and story to be workable, this would have taken place during the 1840s. There are two pieces of evidence refuting this story: The first is a primary source: Edward stated his own period of immigration twice, in the 1900 and 1910 censuses. The dates given were 1857 and 1860, when he would have been about 18-21. Edward's brothers' suggested dates of immigration (John ca. 1855, Eugene, 1861 and Laurence, 1862) tend to reinforce Edward's stated dates. The second piece of evidence is the fact that Edward's youngest brother Matthew was born in Ireland roughly 1851. If this was accurate (and it was unfortunately, uncertified) the earliest possible immigration date for Edward's parents would be circa 1851, when Edward was 12. Finally, the earliest date suggested by a primary source for any Fagan immigration was 1855. I have not located a single record of immigration for a Fagan family member, so a resolution will await new discoveries and indexes. Edward's naturalization papers (#168-277, filed in New York County Superior Court on October 26, 1866) offer little help. There was no Declaration of Intention, a paper which is usually filed three years prior to granting of citizenship. The word "Minor" was written next to his name, suggesting he was under 18 when he filed his DOI. Edward's address was given as 567 3d Avenue, and his witness was George Eason of 449 3d Avenue. No further information was given. Listed at 587 3d ave in the 1868 directory was an Edward Fagan, shoer, who doesn't appear again in Manhattan directories. By 1869, we believe the family departed for Bridgeport. Edward Fagan The third Fagan son listed in the Castlerahan baptismal records was Edward. Edward's baptism is listed twice in May(?) 24, 1838 and then again on June 24, 1839. In fact, there were not two baptisms, but a second transcription of the same baptisms for that day, mistakenly included twice, on page 37 and then again (more clearly) on page 56. Edward himself, in his Civil War Pension file, gave his date of birth as June 2nd 1840. My gut feeling is that the date may have been correct but the year was 1839. In any case, Edward lived a long and productive life, immigrating to the US, fighting in the Civil War, working for P.T. Barnum and becoming progenitor of the Connecticut branch of Fagans. Per family story, Edward (age 17-18) joined the US Army in 1857, lying about his age. In 1861, after release from the army, he enlisted in the Navy, where he served for a year under the name of John Fox. (It was under the name "Edward Fagan alias John Fox" that he applied for a pension in 1909 and received a stipend of $20/monthly in May of 1912.) His obituaries mention a stretch as quartermaster on the gunboat Curlew which was part of a squadron blockading southern waters. Edward's Civil War Pensions file confirms only his Navy stretch, but makes no mention of a earlier or later time spent in the Army. Enlisted March 3, 1863 at Memphis, Tenn.; for one year as seaman. "The records of the Bureau do not show whether or not any prior service was claimed." p. 21. (stamped Mar 26, 1909) states John Fox elisted March 3, 1863 serving on the "Curlew" as seaman to September 30, 1863 and as quartermaster to March 2, 1864, when discharged. Birth in County Cavan, Ireland. Had no residence before enlistment and was a blacksmith. Note: p. 37 includes contradiction of time in New York: three years, moving to Bridgeport in 1867. "...that I enlisted ... under the name of John Fox; that I took said name in order that relatives of mine living in St. Louis at the time would not know of my enlistment..."
Note: this is the only suggestion I have found of westward migration for the Fagans or Caffreys, but I have been unable to find supporting evidence of any relations living in St. Louis. After his release in Cairo, IL, March 2, 1864, Edward made his way east, where on March 28, at St. Stephen's Church on East 28th Street in Manhattan, he married Irish immigrant Anne Golden (imm. 1856, per 1900 census). The 1900 census correctly states that they were married 36 years. 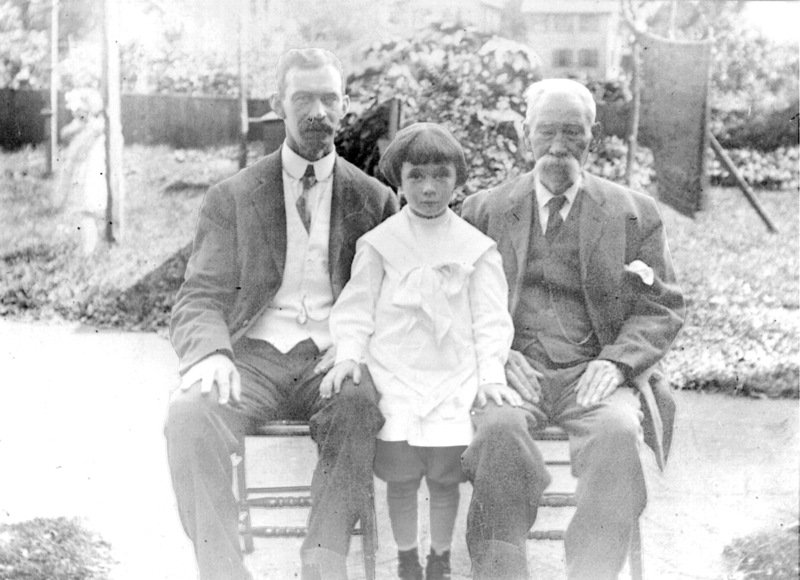 The couple had their first child, Edward Golden Fagan, in New York between that time and 1866. 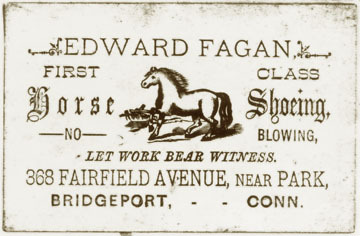 Around 1868, Edward found employment in Bridgeport, Connecticut as a blacksmith. One of Edward's obituaries mentions his early years in Bridgport as an employee. However, he eventually began his own business and though not in the employ of P.T. Barnum (as one obit suggests), the circus provided a portion of his clientele. That Edward's move took place around the time P.T. Barnum established his circus in Bridgeport suggests an impetus for the family's relocation. In Bridgeport the Fagans had four more children. Of the five children, only Edward G., Mary E. and Margaret A. lived to be recorded in any census. Family records, however, list a Helen and a Lizzie who died and are buried in the family plot. Another Barnum connection: the 1880 census shows that his 15-year old son Edward G. Fagan was employed by a Barnum associate named Robert Westendorf. While his parents and sisters lived about a block away, young Edward was listed as a servant to a young Westendorf family living next door to P.T. Barnum. The occupation of the head of this household was "showman". New York-born Edward G., was the only one of their offspring to continue the line. The descendant surnames DUBÉ and ROCKWELL live on in Connecticut. Anne (Golden) Fagan died suddenly of a stroke on Jan 20, 1903, and Edward died in St Vincent's Hospital, Bridgeport on Jan 30, 1914. 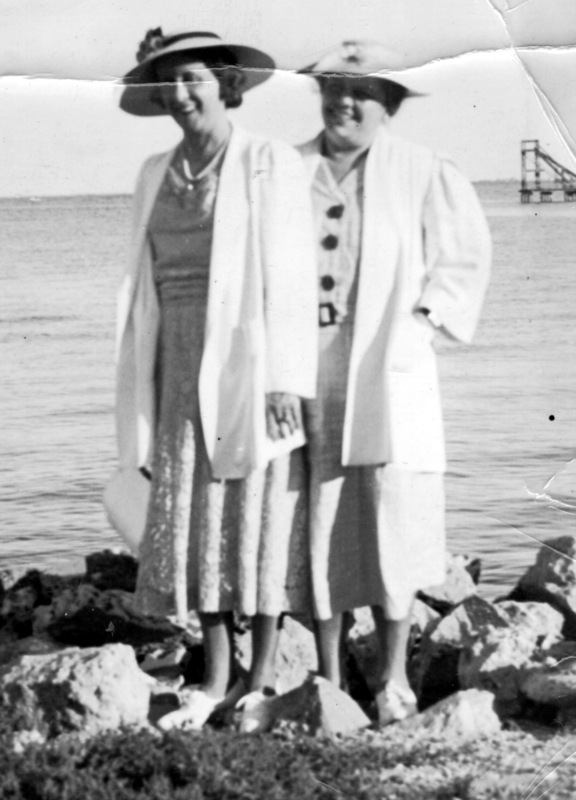 Their daughter Mary E. Fagan (Mamie), a dressmaker, died Sep 15, 1938 in Bridgeport at (roughly) the age of 69. Daughter Margaret was a schoolteacher in the Bridgeport public school system. She was close to her cousin Anna Fenton in Freeport New York, and both maintained relations with the Irish line. As a child, I corresponded with Margaret who was then confined to the Bridgeport nursing home in which she died Mar 21, 1962 at roughly 85. This correspondence was orchestrated by Aunt Anna and executed at her dining room table on her stationery and with implements from her box of ancient fountain pens. Edward and Anne's son Edward Golden Fagan, Superintendent of Mails in the Bridgeport Post Office, died suddenly in his home on December 31, 1928 at the age of 63. His passing was marked in Bridgeport papers with front page stories, detailed biographies, and follow-up reports on the funeral. Edward G.'s widow Christine (Mulvey), a schoolteacher and principal, survived him until 1964. Their three children, Edward G., Marie and Virginia gave him 7 grandchildren and 6 great grandchildren.